Words, they’re funny things. For example: did you know ‘terrific’ originally described something that caused terror? Or that ‘awful’ meant something was worthy of awe? Probably not. Another example of a word that has strayed from its original meaning is ‘streetwear‘. A term that, at one time, could have been clearly defined as ‘an unflattering style of dress consisting of graphic T-shirts, baggy cuts and sneakers,’ is now a great deal trickier to pin down. That’s because streetwear in recent years has made its way off, well, the streets and onto the runway. Haute couture and urban fashion are now largely indistinguishable from one another, leaving people’s idea of what a streetwear brand actually is in disarray. In actuality, streetwear now just has a broader definition. It covers the hip-hop leaning old-school, the fashion-forward new-school, and everything that falls in between. So, to help set the record straight, here’s a rundown of the greatest streetwear brands on the planet right now and why they’re worth your attention. Releasing new items in highly limited weekly drops isn’t the most conventional way to introduce consumers to seasonal collections. Still, when you’ve got queues forming around the block with people who are prepared to sleep on the street just to be in with a chance of copping a brick with your brand’s name on it, well, you must be doing something right. New York’s Supreme is one of the streetwear OGs and one that revolutionised the scene by throwing the traditional supply and demand model out of the window. It’s a move that has seen the skate brand ascend to become one of the most revered names in fashion today, with collaborations with the likes of Rolex and Louis Vuitton. If Shawn Stussy hadn’t surfed his way into the T-shirt business back in 1980, today’s fashion landscape would be a very different place. After creating a buzz with its graphic tees, Stüssy the brand branched out into surf and skate apparel, becoming the first real streetwear label, laying a foundation for those to come. These days, Stüssy is still a driving force in the scene, providing forward-thinking designs while always remaining true to its Californian roots. Granted, it may not have the same clout as some of its hyped-up descendants, but it has stayed respected and steadfast for almost 40 years. Which, in this game, is nothing short of incredible. When thinking of British brands, it’s usually the heritage names that spring to mind as opposed to genre-bending haute streetwear. But with London-based A-Cold-Wall* going from strength to strength in recent years, that could be set to change. Designer Samuel Ross’s trailblazing imprint straddles the line that divides avant-garde and wearable, earning him nods from several industry heavyweights. His label’s designs use utilitarian silhouettes and fabrics to create fashion-week worthy streetwear. Oh, and he’s not opposed to sending the odd naked model down the runway either. Founded in Ura-Harajuku, Tokyo, in 1993, A Bathing Ape (or BAPE) quickly became known as the place to go for off-kilter streetwear with a Japanese touch. Founder Nigo (real name Tomoaki Nagao) is somewhat of a cult figure in the scene, and his obsession with sneakers, toys and in-your-face graphics has seen his label grow into one of the most recognisable there is. Of course, BAPE is best recognised for its bright, multi-coloured camouflage prints and shark hoodies that zip right up over the wearer’s face. These bold design motifs have made the brand popular with teenage hypebeasts the world over. Meanwhile, older streetwear fanatics tend to stay clear. We live in an age when you’re just as likely to see streetwear being paraded down the runway as you are being rocked by the urban youth. 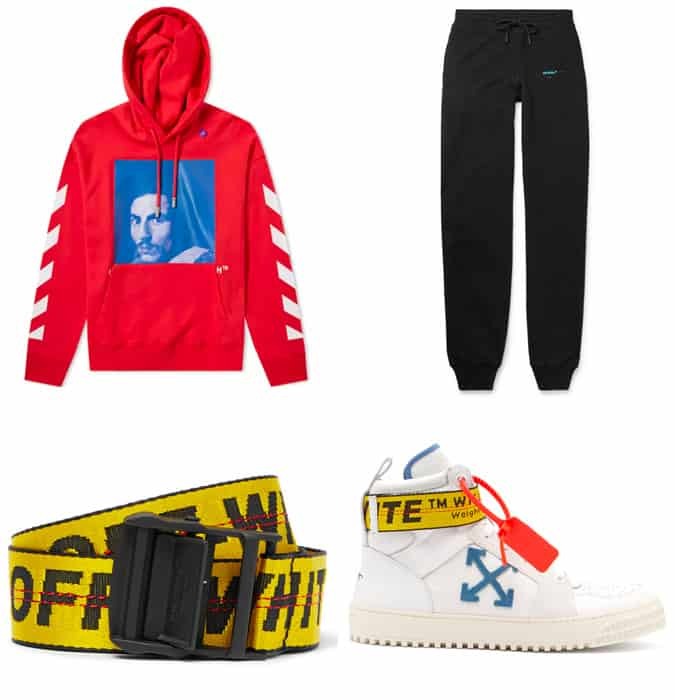 It’s a shift that has redefined what streetwear actually is, and it’s fair to say Off-White was one of the core labels responsible for the shake-up. The brand is the brainchild of Virgil Abloh, a designer with a taste for tongue-in-cheek branding who cut his teeth at Fendi while interning alongside Kanye West. Now creative director of Louis Vuitton, and one of the most influential figures in fashion, Abloh’s own brand Off-White has made it into one of the hottest labels on the face of the earth. Think bold prints, ironic labels and high-profile collaborations aplenty. Who’d have thought that a brand set up to clothe the blue-collar workers of North America in the 1800s would one day mutate into every streetwear aficionado’s go-to label for urban wardrobe essentials? Carhartt WIP (which stands for ‘Work In Progress’) is the cooler European cousin of Detroit workwear stalwart Carhartt. Since the sub-label launched in 1994, it has transformed the brand from purveyor of grubby overalls to the backbone of all the coolest kids’ clothing collections. Combining the rugged quality of heritage Carhartt with an eye for contemporary design, WIP has earned a spot as one of the greatest streetwear brands on the planet. Hard-to-pronounce names are ten a penny in the world of fashion, and if you thought streetwear was going to be any different, you’d be sorely mistaken. According to the Japanese label’s creators, WTAPS is pronounced ‘double taps’. Although quite where they got that from, we’re not sure. The brand has made baggy cuts, military and workwear influences and Japanese utilitarian styling its hallmarks. So expect lots of army green, cargo pants and loose-fitting hoodies, with the occasional preppy Ivy League-style curveball thrown in for good measure. A skate label with a sense of humour (not to mention a knack for whipping hypebeasts into a frenzy), Palace has been putting the UK firmly on the streetwear map since 2010. In the relatively short time it’s been around, the London-born brand has achieved a level of hype not dissimilar to that of its transatlantic doppelganger, Supreme. The USP of Palace is its sporty aesthetic, with tracksuits, baseball caps and regular tie-ups with big hitters like Adidas and Reebok forming the core of its output. Safe, however, it is not. So don’t be surprised if you see the odd snakeskin loafer or smoking jacket crop up from time to time. The brainchild by New York footwear don Ronnie Fieg, Kith operates on two levels. Firstly, it’s a menswear store stocking some of the most coveted names in the sneaker and streetwear world. Secondly, it’s a standalone label, specialising in logo-heavy, urban garments and limited-run collaborations, often with pretty surprising brands. In the past, Kith has joined forces with names as obscure as Bugaboo, the luxury pram manufacturer, and even Coca-Cola. More recently, however, it teamed up with Tommy Hilfiger to produce a nostalgia-laden capsule collection for AW18. The work of Sk8thing – the guy behind the iconic graphics of Human Made, Billionaire Boys Club and Ice Cream – and music industry veteran Toby Feltwell, Cav Empt is a brand championed by those who outgrew their Supreme box logo hoodies and went looking for something fresh and exciting. With an emphasis on unique prints, utilitarian detailing and futuristic styling, the Japanese label has positioned itself as one of the most sought-after names in this post-streetwear age. Comme des Garçons is a fashion house with a reputation for outlandish designs and bizarre runway shows. However, the label’s Play imprint is known for quite the opposite. Featuring the iconic bug-eyed heart logo, the output of CDG Play instead focuses on simple staple items like Breton tops, hoodies and logo tees. There’s also a long-running collaborative effort with Converse which has seen Rei Kawakubo’s brand put its stamp on the Chuck Taylor All Star 70, creating one of the most popular shoes in streetwear in the process. Started by two veteran players in Amsterdam’s hip-hop scene, Patta was what happened when a pair of friends with a love of beats, sneakers and streetwear got together and opened a store to showcase their favourite gear. In the early days, the Patta logo was printed onto a small batch of tees for family and friends, but as demand grew, this soon evolved into a fully-fledged in-house brand. The focus is on big logos, loose cuts and vibrant colours, with seasonal collections routinely flying off shelves in no time at all. Oregonian OG Nike is so much more than just a streetwear brand. Sneaker culture is a huge part of streetwear and any sneakerhead worth his or her salt will tell you that ole Swoosh is the most respected label in the game. A fair share of its success is down to the masterful work of footwear designer Tinker Hatfield, who created some of the brand’s most iconic silhouettes, including the Air Max 1, MAG and countless Air Jordans. There’s also a smart approach to special partnerships to be thanked, with a long list of hyped collabs that have helped the brand establish itself as one of the leading names in this notoriously picky scene. What do you do when you hit your mid-twenties and start to wonder whether or not you should still be rocking an oversized hoodie and Air Jordans at your age? You start shopping at New York-based Noah, of course. Set up by former Supreme creative director Brenden Babenzien, Noah is streetwear for grown-ups. Offering everything from corduroy caps and collegiate sweats to Oxford shirts and tailoring with a twist, its considered output provides a reliable alternative when the day comes to give up the hype. Undercover’s weirdly wonderful designs and next-level graphic print T-shirts made it a pillar of the ultra-hip Ura-Harajuku scene in ’90s Tokyo. Today, it’s one of the most respected fashion-leaning labels in streetwear and a firm favourite among those in the know. Originator Jun Takahashi was heavily influenced by the UK punk scene when he was younger, which is visible in some of his more daring designs. Aside from that, Undercover also produces fashion-forward luxury sportswear in collaboration with Nike under the Gyakusou name. Russian photographer-slash-designer Gosha Rubchinskiy’s name doesn’t exactly roll off the tongue. However, the fact his eponymous label is tricky to say (it’s goh-shah rub-chin-skee, by the way) hasn’t stopped it from becoming one of the most talked about in fashion. Embodying post-soviet youth through his sport and skate-influenced designs and use of young, unconventional models, Rubchinskiy earned the respect of his peers early on and was taken under the wing of Comme des Garçons’ Rei Kawakubo who now assists in the production of his seasonal collections. One of the founding members of music and fashion collective Been Trill, alongside Virgil Abloh and Alyx’s Matthew Williams, Heron Preston has since gone one to join his two peers (so to speak) in going solo. His namesake label has grown into one of the most influential forces in contemporary fashion while retaining a cult-like status. Think oversized cuts, quirky motifs and signature bright orange branding. Adidas may not be what you’d think of as a typical streetwear brand. But then, what is a typical streetwear brand nowadays anyway? Regardless, when you take into account the German sportswear brand is responsible for churning out Kanye West’s Yeezy line of sneakers, it’s inclusion begins to make a bit more sense. The Yeezy Boost range, designed in conjunction with Ye, produced some of the most talked-about and sought-after shoes in recent history. It also helped to put Adidas firmly on the streetwear map. And now, with the 1990s footwear trend in full swing, Three Stripes’ place within the scene is only becoming better established. If you needed any proof that the ‘grubby’ streetwear lot have fully infiltrated the once-exclusive high fashion world, look no further than Vetements. A ground-breaking design collective in its own right, the firm was founded by Demna Gvasalia, a Georgian fashion maverick who now sits at the helm of Balenciaga. Vetements is about as divisive as they come. The label has caused a stir through its appropriation of broader culture into ironic or tongue-in-cheek garments. Remember that DHL T-shirt ticketed for over £300? Fashion or farse? You decide.